I did make a formal complaint to the ASA on 13th October 2011, regarding BT’s inaccurate Infinity advertising on TV and many other media forms. It simply is NOT fibre optic broadband. If the original ADSL broadband was not called “fibre” when almost all telephone switches providing it had fibre going into them, then pushing the fibre one “hop” further to street PCPs doesn’t change the definition suddenly. Why have BT decided to call the new stuff “fibre” when the old stuff wasn’t “fibre”? Opportunistic at best. Utter poppycock to anyone that understands digital transmission systems, but there you go. The ASA have got it wrong twice, as Joe Public certainly doesn’t understand how 3ft of copper can make nonsense of an otherwise all-fibre circuit. BT and Virgin are relying on the widely accepted understanding that fibre optic lines are FAST, which is why the ASA are not upholding my complaint. However, BT and Virgin ignore the far less widely understood knowledge that copper transmission over even short distances is unreliable in rural areas. There is a clear case of misleading representation of transmission capability by both BT and Virgin here, which the ASA is not understanding. Decisions like these makes you wonder what idiots are running these departments/quangos. It seems the ASA is as useless as OFCOM. If we compare fibre broadband to HS2, you could build a high speed line from London to Brackley, then use the existing track from Brackley to Birmingham, and still claim you have a high speed service from London to Birmingham. I wonder if the ASA would uphold any complaints about that! On the subject of railways… slow, unreliable, overcrowded, lack of investment. Sounds familiar! I did just that last year and the ASA declined to take it further since the phrase ‘fibre broadband’ had already been used in the marketplace by multiple providers, although they did concede that it wasn’t entirely clear for consumers. I also complained the the ASA and got the same response – they’ve had the wool pulled over their eyes. 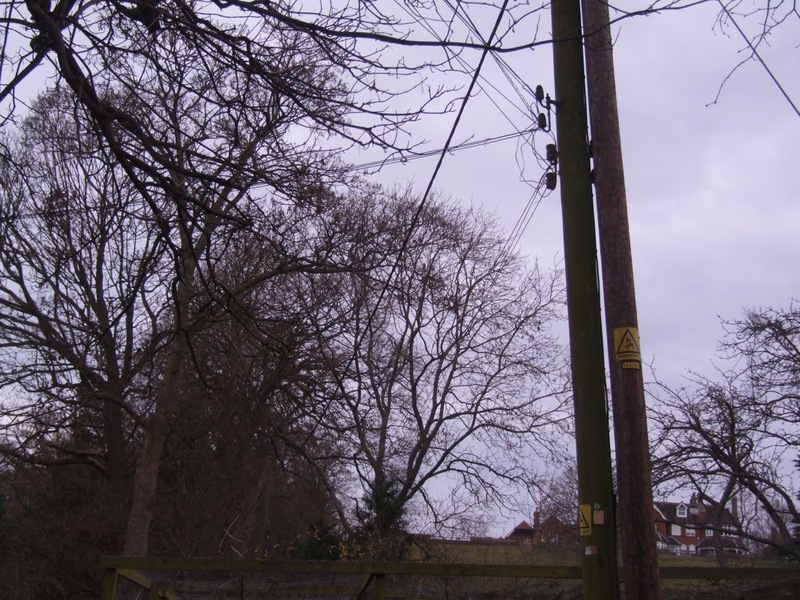 looking at the telegraph pole picture , it seems pretty obvious why they haven’t moved the lines. They all lead away in one direction, they are not long enough to reach the new pole. They would therefore probably have to change all the lines from this pole to the respective houses/other poles, at which point the locals would be up in arms about the break in service. As for the ASA and “fibre broadband” , it is same stitch up from the ADSL days, but then you could argue Fixed Wireless services are “Cable Broadband” as they have ethernet from the aerial into the property… So where do you draw the line? FTTC is no more “fibre broadband” than ADSL is (or indeed isn’t!). An BT exchange is supplied by fibre then ADSL broadband delivered via copper. A cabinet is just a mini exchange making the old copper wires a bit shorter for premises that used to be a long way from an exchange. There needs to be competition at the level of Openreach, and Openreach needs separating off from BT to remove a fundamental conflict of interest. But you won’t find anyone to buy an outdated infrastructure based on old copper lines. Deliberate sneaky move by BT PLC (through Openreach) to protect the monopoly. The nation is stuffed now. Ofcom should never have agreed to FTTC. BTW should have consumed SLU from a hived-off Openreach plus a few other competitors to choose from – all with equal access to BT’s original infrastructure. It would then have been do or die for Openreach.